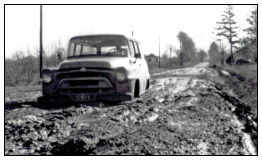 Back in 1958, Robert Young borrowed his dad’s tractor, a seeder and, with a vision, Young Sod Farms was born. Robert Young’s (Bob) philosophy has always been “treat people the same as you wish to be treated, whether it is a customer, employee, or supplier”. This still remains true today. 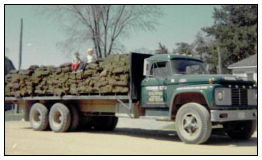 We have seen many changes throughout the years from each harvesting crew having 4 to 5 men cutting the sod, rolling and carrying to the truck, loading and unloading all by hand. Today we have a state of the art, computerized harvester that one person operates. Some of the original equipment used 50 years ago has been restored and displayed at the sales yard. Bob and his wife Shirley started out with 13 acres of production and thought the following year the other half of the farm would be sowed. At this time we are farming over 2000 acres with crop rotations varying from corn, soybeans and wheat. Over the years, a succession plan had been organized which was very helpful in the change of ownership to the next generation. In 2004 the family business was purchased by Bob’s daughter and her husband, Barb and Scott Christopher. Many changes and improvements have taken place since then. There has been a lot of time and effort put into the updating of the environmental farm plan so that new equipment, buildings and permits are in place for the future. The third generation is now actively involved in the company. 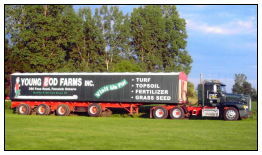 Young Sod Farms is an active member of the Nursery Sod Growers Association, Turf grass Producers International, Landscape Ontario, Chamber of Commerce, Ontario Federation of Agriculture, to name a few. 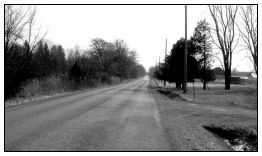 Over the years it has always been a tradition to make charitable donations to places such as local hospitals, University of Guelph Turf grass Research Centre, and the local community. We are proud to say we have had Farm Safety come each spring to educate our staff for the last 37 years. We are now celebrating 60 years in business and Young Sod Farms Inc. still remains committed to providing top quality turf, topsoil, fertilizer and seed to our valued customers. Our staff is always willing to assist in making your lawn beautiful.